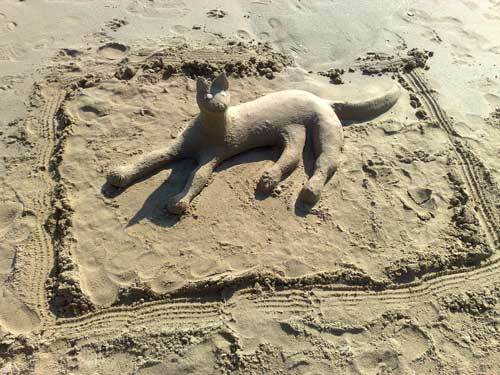 We were most impressed the other night to stumble across this 3D sand sculpture of a cat on our local beach. You can now subscribe to get updates to 'A lemon tree of our own' sent to you by email. We've never paid it much attention, and even when I spotted that there was a museum around the back, we had no burning desire to see it. 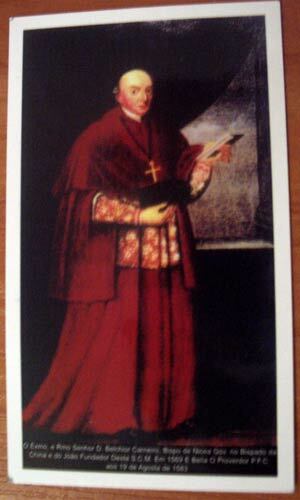 Until, of course, I found out that the skull of the founding Bishop was on display there! Well, you know us, whether it is an ossuary in the Czech Republic, a severed hand in Budapest or mummified monks in Rome, we can never resist the public display of holy bones and body parts. 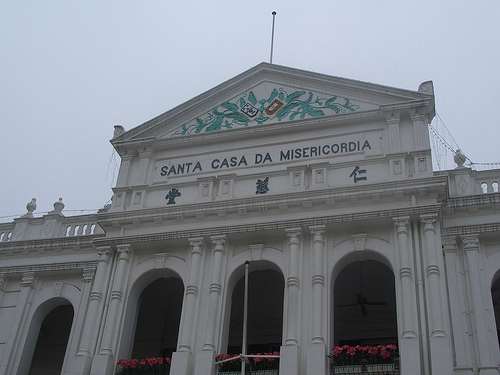 You enter the Holy House of Mercy around the side through the Travessa Da Miseriacórdia, and pay at the top of a set of stairs. 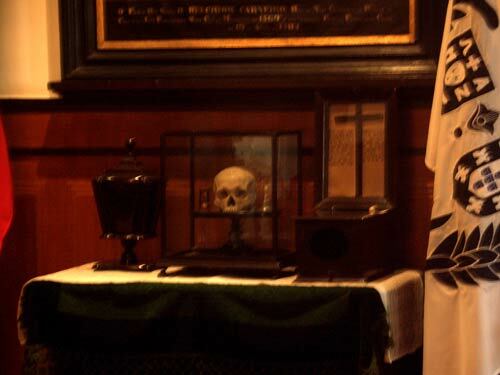 The first room includes a display of old religious paraphernalia, but it is the main room which features the skull. The room is set out like a board-room, with the main table roped off, and underneath a portrait of the original owner sits the skull of Bishop Belchior Carneiro. 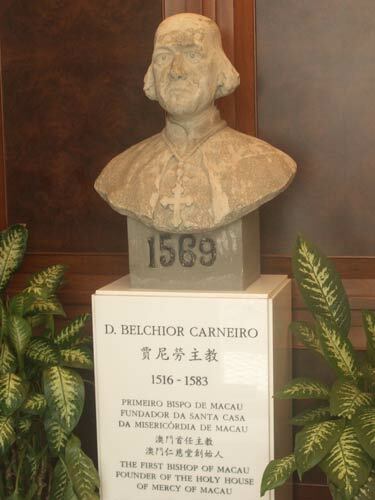 He was the first Bishop of Macau and in 1569 he founded the Holy House of Mercy to take in waifs, strays and fallen women. I took a couple of pictures of the skull, and the museum guard came rushing in. I thought he was going to tell me off for using the camera, but instead he threw wide open the doors to the balcony and said in very broken English "Pictures! Pictures!" and practically pushed me outside. 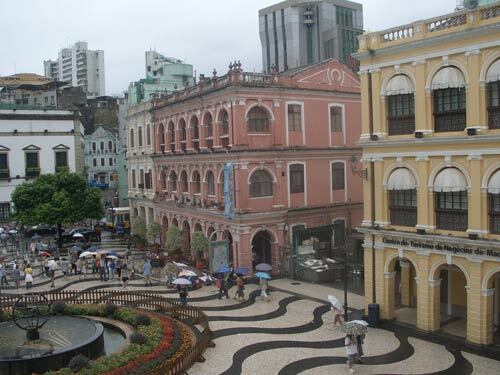 The balcony itself was beautifully decorated and laid out, but the main thing was that it commanded an excellent view down upon Senado Square, and was probably the best location on Macau to get photos of this central space. The giants of basketball - missing stunt photo! Sadly I missed out on a brilliant photo, because I couldn't get my camera ready in time. 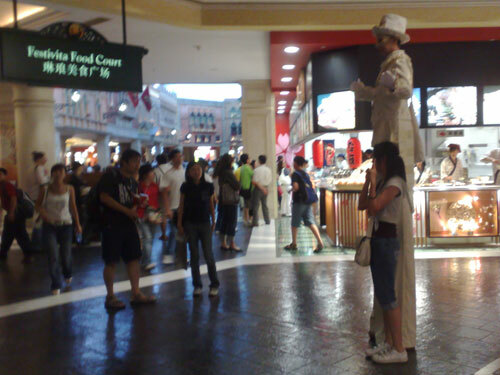 We were walking through the Venetian Casino's Shopping Mall in Macau, when we came across this chap on stilts. 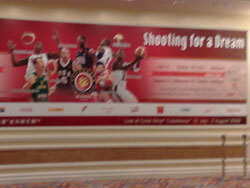 The thing was, at the time, the casino was holding a mini-basketball competition between the USA, Turkey and Lithuania. As the stilts-man walked around, towering over the Chinese, he was being followed by two of the Lithuanian basketball team, who basically were only fractionally smaller than the guy on stilts. I have never seen such big people in all my life, and to see them walking behind a chap on stilts who only just equalled their height was hilarious. 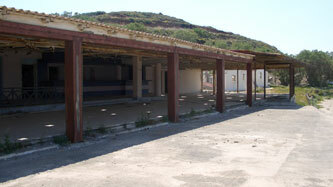 We recently had an interesting comment on our Lemon Tree piece about the abandoned Aptera Beach resort that is near us. "I was of course curious what had happened to the hotel which, in my opinion (and some others i read) is perfectly located close to a beautiful beach. And as I searched for answers I came across an answer not so shocking in these days when it comes to people. Money! The two male owners of the hotel resort had secretly stolen money from the profits, without either one knowing the other one also did so. Of course this couldn't go on forever and somehow they were exposed. The fighting between them resulted in more disappearance of cash and finally they both left the resort. The staff struggled against the authorities to run the place and kept the resort going for another 4-5 months after the disappearance of the owners. But they couldn't afford to pay rent for none of these months. If you have something on the beach a monthly beach-license-fee must also be paid and they couldn't afford this either. Finally the Police had to throw them out! 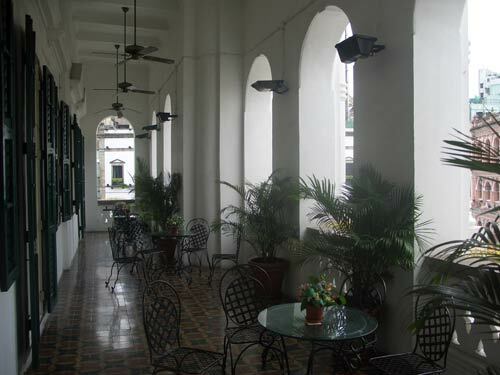 A deadline was given for the staff and guests and then the place was left quiet and empty. 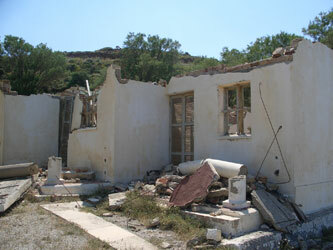 But the contract for the resort, rent paid or not, stretched over 10 years and in Greek law this means the resort cannot be demolished. The spooky empty resort must stand its ground for the entire period of its contract! Only after a couple of days of emptiness people started to loot and trash whatever was left and the place slowly turned into the ruins they are today. A very sad story I must say and I visuallized myself starting it up again. A very costly and risky business to get oneself into, but as the contract period expires, which was any time now, I'm sure someone with solid finances will start something again. Hopefully something as beautiful as you describe Aptera was in its time of glory. 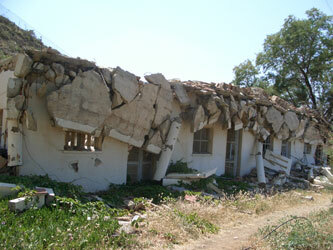 This information I gathered from locals living there and it seem logical, but of course one can't be sure its 100 % true." It is an interesting tale, but like Daniel, I have to express some caution. It is always difficult to separate rumour, fact, and stories that sounds good for tourists - I've myself heard three different versions of how the bird was removed from the top of the Germaniko Pouli war memorial! 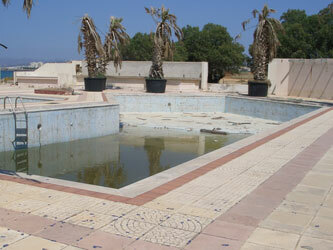 Incidentally, our photos of Aptera Beach Resort recently featured on a website which listed 16 abandoned hotel complexes - some of the others look really intriguing too. You wanna drink my sweat? Calimero! Calimero! I feel like chicken tonight! All about raki. Sort of. Moving country can be a disconcerting experience, but we've found lots of amusing strange little quirks in Crete which keep our spirits up. Like lots of pictures of Obelix. And I can often be found poking around in quirky abondoned buildings. Then once we got to Austria there was The W�stenrot invasion, Vergeiner and the door frame that changed colour. Here is a list of all the Quirks we wrote about before September 2007. Where are the other 98? Special Simpsons Road Rage Easter Eggs. At Christmas? The door frame changes colour. But why? Wie du mir - so ich dir? Phew! What a bizarre system! A rhino? With wings? In Germany? Naked saxamaphone lady - the proof!